The highest number was reported from Meerut zone where 569 encounters took place. Undeterred by allegations of “fake encounters” by the opposition, the Uttar Pradesh Police under Yogi Adityanath’s chief ministership has killed 50 dreaded criminals in as many encounters in the past over one year, officials said. The 50th case of a criminal being shot dead in an encounter, since the Bharatiya Janata Party government came to power last March, was on May 3 when notorious criminal Rehan, who was carrying a reward of Rs 50,000 was gunned down in Muzaffarnagar district, they said. Rehan, an active member of Mukeen Kala gang, had 15 serious criminal cases against him, police officials said. In the past one year, as per figures up to March, 50 criminals were killed and another 390 injured while 3,435 history-sheeters were put behind bars following encounters. Four police personnel were killed and 308 injured in these gun-battles. 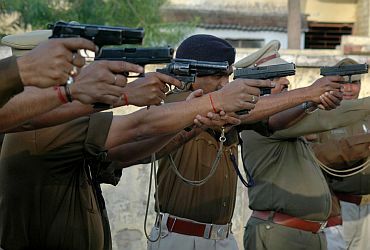 According to official data, ever since the Adityanath government came to power, there have been over 1,478 police encounters in the state between March 20, 2017 and March 25, 2018. The highest number was reported from Meerut zone where 569 encounters took place followed by Bareilly zone which had 253 encounters. Third on the list was Agra zone with 241 encounters followed by Kanpur zone with 112 encounters. There were 51 encounters in Gorakhpur, the home turf of Adityanath. The police have invoked the stringent National Security Act against 188 criminals and seized assets worth over Rs 150 crore, officials said. poses a threat to the security of the state/country or the maintenance of public order. During this period, Gangster’s Act was imposed on 1,455 persons and 4,881 criminals were arrested. Among those killed included Balraj Bhati (who carried a reward of Rs 2.5 lakh) in Noida, Shravan (reward Rs one lakh) in Noida, Bagga Singh (reward Rs one lakh) in Kheri. Besides Mukesh Kumar Rajbhar in Azamgarh, Mohan Pasi in Hapur, Nitin, Furkan and Shamim in Muzaffar Nagar, Sabir and Akbar in Shamli, Noor Mohammad in Meerut, Sumit Gurjar, Aslam in Noida, Vikas and Ramjani in Aligarh and Sonu Kumar in Bulandshahr were gunned down. All of them were carrying a reward of Rs 50,000 each on their arrest. Magisterial probes are underway in all these encounters, police said. However, in what may appear as phenomenal success against crime, has not satisfied the opposition. “They are using encounters for settling political scores. In the name of maintaining law and order, the encounters were started but with police resorting to fake encounters there is no impact of it. Crime is increasing and the BJP government has failed to check it,” Samajwadi Party MLC Rajpal Kahsyap claimed. However, as the BJP government goes ahead with its no tolerance policy against crime, it is also realising the encounters may come with their own baggage. The killing of Sumit Gurjar, shot dead by the police in Noida, had raised eyebrows and the National Human Rights Commission has sent a notice to the UP government over it. What have UP's 1,350 encounters achieved?